Bursting disks are used to protect equipment such as reactor vessels, transfer vessels, storage tanks and purified water systems against excess pressure. Overpressure conditions can occur by over filling, runaway reactions, external fire or during cleaning processes such as sterilising or steaming-in-place (SIP). Such conditions can lead to damaged equipment, process interruptions, production loss, and injuries to personnel. Protecting equipment with a bursting disk in sanitary or aseptic service conditions requires specific solutions. Specific design elements that must be considered in selecting a bursting disk for use in sanitary service include minimising crevices and dead space, compatibility with equipment connections and cleaning protocols, small sizes with excellent opening characteristics for both gas and liquid service, suitability for cycling conditions and ability to withstand full vacuum. Modern bursting disks also incorporate non-fragmentation features which ensure the disk remains intact after opening. The GCR-STM reverse buckling disk from BS&B for example utilizes a circular score line located at the edge of the domed area, on the downstream side of the disk. At the marked burst pressure, the disk's dome reverses and opens by shearing around the circular score line. The opening characteristics of the bursting disk are also an important consideration. In many applications the disk must enable very low burst pressures and facilitate flow performance in sizes as small as 40mm (eg, full liquid applications such as purified water systems.) The GCR-STM uses SAF- technology (Structural Apex Forming) enabling very low burst pressures to be achieved with excellent opening characteristics. The integration of an energy absorbing hinge located on the downstream side of the disk is a design feature from BS&B which enables GCR-STM to perform in gas or liquid service with superior flow performance. Structural Apex Forming, the central 'dimple' present in BS&B Rupture Disks, is another design feature which ensures that a damaged disk will rupture at or below the marked burst pressure. Structural Apex Forming minimises torque sensitivity allowing the disk to be installed in standard DIN and ISO Tri-clamp connections as well as special designs to minimize dead space. Minimum dead space can also be achieved between the process fluid and the disk when installed in BS&B’s FM-C holder or a Novaseptic holder ensuring the dome of the disk is flush with the vessel wall. 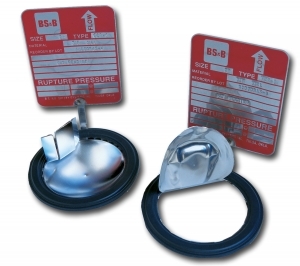 Incorporating sensor technology into bursting disk design (such as BS&B’s Sanitary Alert Sensor) provides warning of a burst disk. Leaking disk detection is also possible. Alternatively an integral sensor can be provided to eliminate the need for an extra clamp connection. Finally, for certain applications (eg, CIP/SIP Service) disks with reverse buckling features (ie with the smooth side of the disk to the process) may be preferred. In such conditions, by loading the Reverse Buckling disk in compression it is able to resist operating pressures up to 95 per cent of the minimum burst pressure even under pressure cycling or pulsating conditions.